OK, so you know I'm in this awesome nail art challenge group, The Digit-al Dozen? Did you you know this month is one year that we've been doing our thing? Did you know that we are having a spectacular giveaway for you as part of our celebration? We also decided to celebrate this month by doing 12 days of nail art, each day based on each month of our challenge themes. So to start off, our very first theme, a year ago this month was simply "blue". If you want to see the mani I did for blue last year, it's right here! 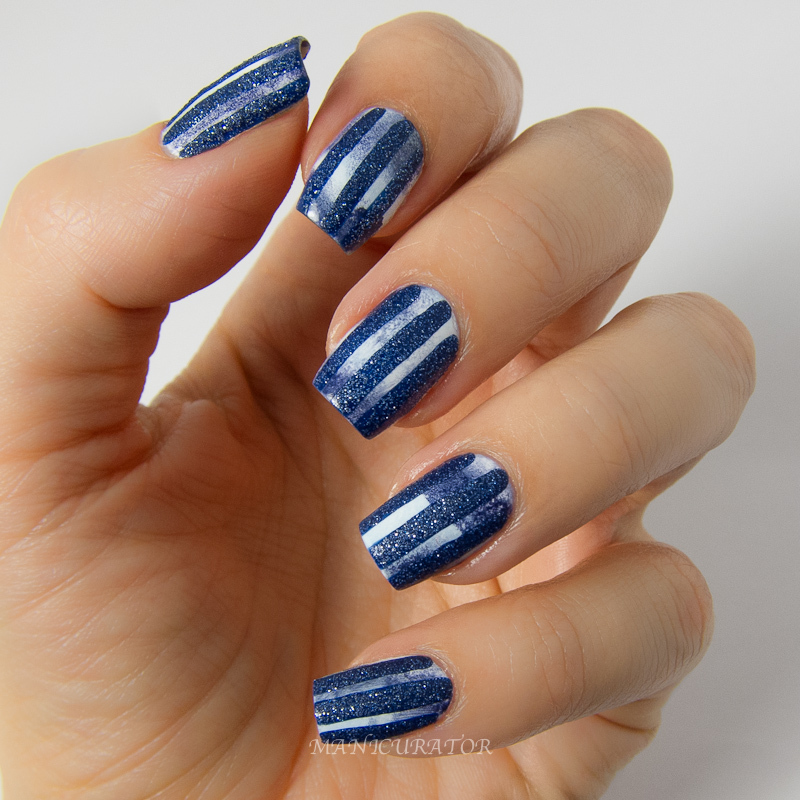 I wanted an interesting and non uniform base for this mani, so I randomly painted Zoya Blu, Purity and Sailor onto a triangular makeup sponge. I then sponged it onto each nail, turning the sponge in different directions to get a different pattern on each nail. (I had a base of Zoya Purity already dry when I sponged.) It was really easy to do this sponge mani, harder to clean it up off my skin and cuticles! Once this was cleaned up, I applied HK Girl fast dry top coat and gave it some time to dry. Then I used a striper brush from Born Pretty and free handed stripes of Zoya Sunshine. I found the brush really easy to use, the whole set is great actually. I've been trying out each of the brushes one by one. If you are thinking of a Born Pretty purchase you can use this code: DS7X31 for a 10% discount (I get no commission). This was my first time free handing stripes like this and I'm quite pleased with how it turned out. In fact, the end result of this manicure looks very much how I envisioned it :D Love when that happens. That is beautiful! I couldn't really tell what was going on in the first picture, it's like an optical illusion! Lovely love! fell in love the moment I saw this on instagram. This is a very cool look and your freehanded stripes came out amazing! 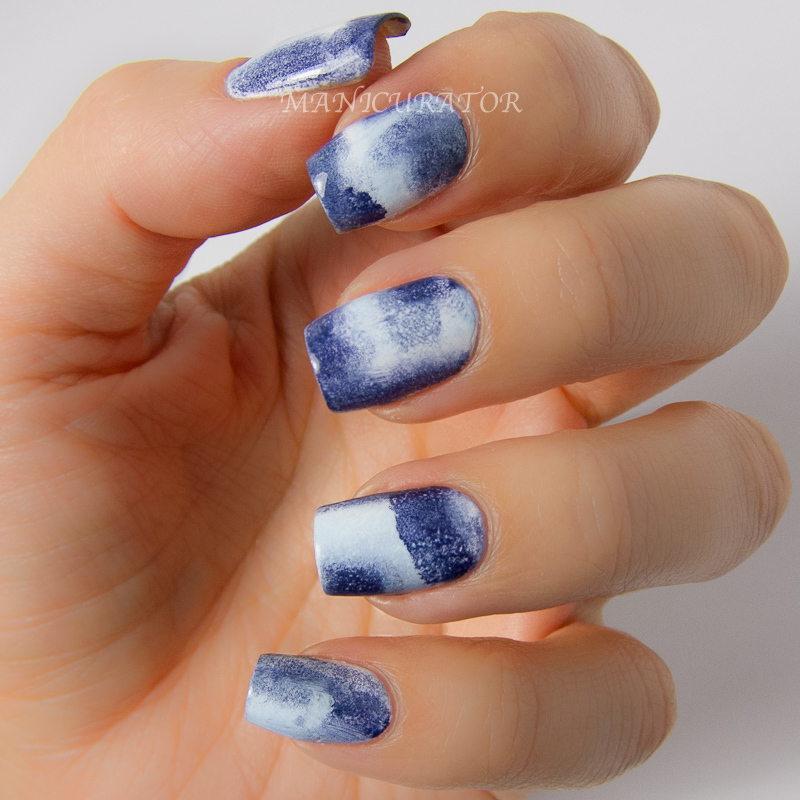 I like your mani with the stipes but I love the sponged look without the stripes. This is really cute. After looking at it for a bit I got to thinking...the base kinda looks like the sky with clouds...and the lines like the bars on a jail cell...so the full mani looks like what it would be like to be looking thru prison bars to the outside LOL. Wow...I have one heck of an imagination....tie that to utter boredom and I can be pretty silly LOL. Don't mind me...I have clearly lost what little bit of mind I had left LOL. Thanks! I know a lot of people told me they loved it before the stripes too! HA I had a similar fleeting thought! what a beautiful start to the week!